Mia, a seventeen year-old high schooler, is on a drive with her family when a truck crashes into them. Mia becomes detached from her body and a spirit form of Mia emerges. At this point, Mia exists physically and spiritually. In her spiritual form, Mia cannot touch or feel anything other than her inner feelings, and nobody can see, hear, or feel her. She wounds up in the Intensive Care Unit of a hospital and struggles to decide whether she should stay alive or not. 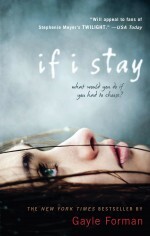 The author allows the readers to see through Mia’s thoughts and memories, as she debates whether she should live or die. Throughout the plot, the reader learns about Mia’s memories, such as how she meets her boyfriend, Adam and how she meets her best friend, Kim. The readers learn about her history with her family, her doubts about herself, and her passion for cello playing. Meanwhile, Mia’s family and friends are also working hard to remind Mia of her other family, and Adam tries to break into the ICU to see Mia. Through the help of Willow, a nurse and Mia’s family’s friend, he is able to see her. In the end of the story, Adam tells Mia that he loves her and would do anything in order to make her stay. In the end, Mia reveals her decision. The author successfully emphasizes the important role that family plays in an individual’s life. Gayle Forman employs first person point of view, which is effectively used by Forman to telling the readers what Mia is feeling and thinking. The writer fully describes what the characters look like, so we can use them to connect to the events that occur. If Forman showcased more members of Mia’s family it would have more fully developed the story because the family members could have helped Mia to recover. The complex vocabulary Forman uses exposes young readers to advanced words by taking simplistic words and replacing them with complicated words is wonderful. Teenagers who are experiencing hard times will enjoy this book. If I could go back in time, I would definitely choose this book again. If I Stay is nine out of ten stars earned for its great plot. 1. What caused the schools’ closure? 2. Who are Henry and Willow? 3. What did Mia refer to her family as after the car accident? 4. Why were Mia and Adam uncomfortable with each other after the Yo-Yo Ma concert? 5. How did Kim and Mia become friends? 6. What did “she’s running the show” mean? 7. Why did Mia not like Adam’s shows? 8. What kind of code does Shooting Star have? 9. When did Mia really see that Kim and Adam were bound through her? 10. Why did Kim and Adam ask Brooke Vega to go to the hospital with them? 11. Why were Mia’s family, Henry’s family, and Adam discussing what they want for their funeral? 12. How did Mia’s grandmother say how Mia made up for being a good girl? 13. When did Henry finally realize why Mia’s father quit the band? 14. Why did Adam think Mia’s state became worse after he went into the room? 15. Why did Kim list all the people who went to the hospital or wanted to go to the hospital for Mia?